(CNN) -- Colin Montgomerie has been given an extra wild card pick for next year's Ryder Cup match against the United States at Celtic Manor in Wales. 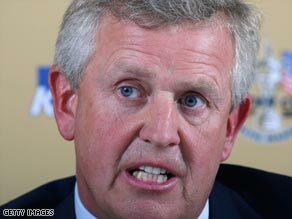 Montgomerie is determined to regain the Ryder Cup for the European team. Monty will now have three choices from his 12-strong team for the biennial match as Europe bid to win back the Ryder Cup after their heavy defeat at Valhalla last year. Five of his side will be automatically selected from the European Tour's Order of Merit, with four coming from the world ranking points list. The United States, at the direct request of captain Paul Azinger, doubled their picks from two to four for last year's clash, the move paying off as they won by five points in Kentucky. Montgomerie will be the first European captain to have three wild cards since Bernard Gallacher in 1993 with a reduction to two being made for the next match. The status quo has existed since then but caused Europe's captain last year Nick Faldo considerable problems in the build-up to Valhalla. Faldo controversially gave his wild cards to Paul Casey and Ian Poulter even though both stayed based in the United States during the final month of qualifying. Ironically, Poulter turned out to be Europe's star player in the defeat, but the omission of Darren Clarke, a hero of the 2006 win at the K-Club, proved unpopular. The decision to increase the number of wild cards was taken by the European Players' Committee ahead of the Irish Open in County Louth which starts on Thursday. Qualifying starts in September and will continue until the end of August next year when Montgomerie will finalize his team selection.